For those looking for a charitable company in which to partner with this holiday season, one need not look much further than Kroger. NEW YORK (F.A.S.T. Graphs) -- Cincinnati-based Kroger (KR - Get Report) is one of the world's largest retailers, employing over 340,000 associates in over 2,400 supermarkets and multi-department stores in 31 states. While most should be familiar with the Kroger name, the company also operates under two dozen local banners including Dillon's, Fred Meyer, QFC, Ralph's and Smith's. For those looking for a charitable company in which to partner with this holiday season, one need not look much further than Kroger. Forbes recognized Kroger as being the "most generous company in America" due to its support of hunger relief, breast cancer awareness, the military and more than 30,000 schools and grassroots organizations. Kroger contributes food and funds that are equal to 200 million meals each year. Additionally, while some companies give more on an absolute basis, Kroger gives away substantially more on a percentage basis -- over 9% of its pretax profits. It is true these generous donations could be doled out to shareholders instead, but Kroger has proven its ability to mix consistent shareholder rewards with a true passion for the community. 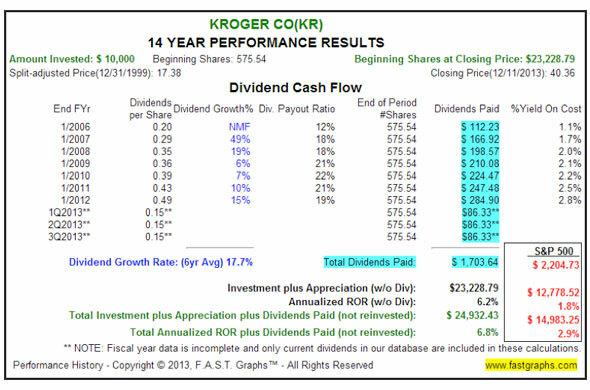 Kroger initiated a dividend in 2006 and since then has not only paid but also increased this payout for eight consecutive years -- averaging a 19% per annum increase. 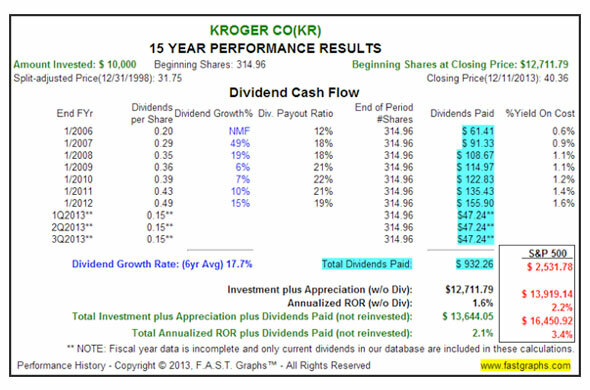 Despite this robust dividend growth, Kroger is still only paying out about a fifth of its earnings in the form of a dividend. 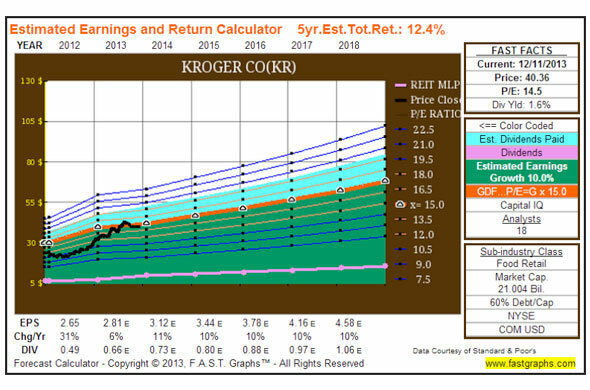 On the share repurchase front it seems Kroger has the same zeal towards reducing share count as it does toward increasing dividends. At the beginning of 2000, Kroger had roughly 835 million common shares outstanding. Today, that number stands at about 516 million, a decrease of almost 4% annually over the past 13 years. It follows that a sustained repurchase program will continue to boost earnings per share growth. Of course none of this is to suggest the company is without risks. Although Kroger is a very large grocer selling nearly $100 billion a year, it has to compete with the likes of Wal-Mart ( WMT - Get Report) and Target ( TGT - Get Report), not to mention every local grocery that you can imagine. Further, the mega retailers can afford to use the grocery segment as a loss leader to get customers into the door -- something Kroger is largely unable to do. In other words, Kroger needs to make money from food sales while the bigger players can afford to subsidize lower food prices in an effort to drum up demand for their higher-margin offerings. Yet, despite this seemingly large disadvantage, Kroger has been able to increase same-store sales every quarter for the last decade. With these thoughts in mind, one might be inclined to look a bit deeper into the history and current standing of Kroger shares. Unfortunately, many Web sites will likely lead an investor to a price-only graph similar to the one depicted below. In viewing price (black line) alone, it might appear as though now is an awful time to invest -- Kroger has run up significantly in the last two years. Yet, this view is somewhat misguided. One cannot make the determination of whether or not an investment might be offering an attractive proposition without also considering the relative valuation. In the above graph, note that the price went down to start the period, stayed relatively flat throughout the middle years and has increased abruptly of late. Consequently, one might also expect that the business results over this time period followed a similar pattern. However, this is not necessarily what we see. Below I have included the graph of Kroger's earnings (orange line) along with dividends (pink line and blue shaded area) from 1999 until today. Interestingly, although there were bumps along the way, Kroger basically had an upward trend in operating earnings per share -- growing this metric by just under 7% per year. In just three of the 15 years did Kroger see profits that were lower than the previous year. On this graph note that while there was some cyclicality, the business results of the company are by no means as finicky as the stock's price. This realization is paramount for the long-term investor. 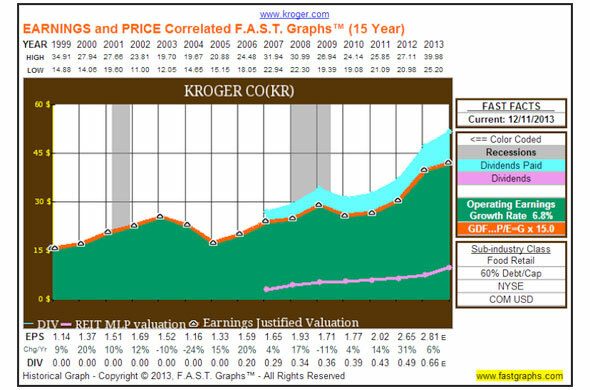 If we combine the above two graphs, we find the Earnings and Price Correlated F.A.S.T. Graph below. Note that at the beginning of the period the price was much higher than justified earnings, in the middle price more or less followed earnings, after the most recent recession shares were trading at a bit of a discount, and today the stock price has matched up almost perfectly with the underlying earnings of the company. From this graph is an important lesson. At the beginning of the period, shares of Kroger were trading at roughly 30 times earnings as compared to the price-to-earnings ratio closer to 15 today. Consequently, the performance results of the company greatly trailed the business results. Kroger was able to grow operating earnings by about 7% a year while the investor only received returns, including dividends, of roughly 2% a year. However, this ideology becomes especially compelling when shares are trading near or below fair value. 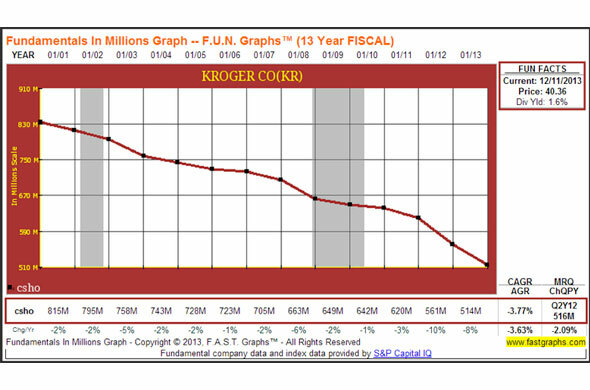 For instance, if one views the past operating history of Kroger during the last 14 years -- just a one-year shorter timeframe -- the graph below would look quite similar to the one above. Nevertheless, now notice that the price at the beginning of this period was trading quite close to its justified earnings mark. Consequentially, it should be expected that performance results would roughly track business results over the long term. And this is precisely what we see. While the operating growth rate of 6.7% is effectively the same as before, notice that the performance results are substantially higher. This stems directly from the concept of paying a reasonable valuation. 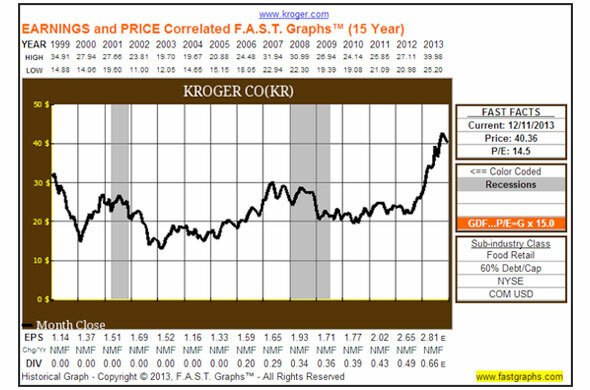 Today, shares of Kroger appear to be trading within a reasonable range of where they have historically. In turn, it might be the expectation of the prudent investor that performance results could roughly track business results over the long term. For instance, in the Estimated Earnings and Return Calculator seen below a 10% expected growth rate with an assumed P/E ratio of 15 in five years' time would equate to a 12.4% annualized total return including dividends. It's important to remember that this is simply a calculator, but it generally provides a strong baseline for how analysts are presently viewing this company. More important, it should be evident that paying a "reasonable" price more or less equates to performance results that track business results over the long term. Overall, Kroger is a very strong player in the grocery market and has proven to not only be generous but also shareholder-friendly. However, as always, I recommend that the reader conduct his or her own further thorough due diligence.